BEDSURE Sherpa Throw Blanket — Deals from SaveaLoonie! 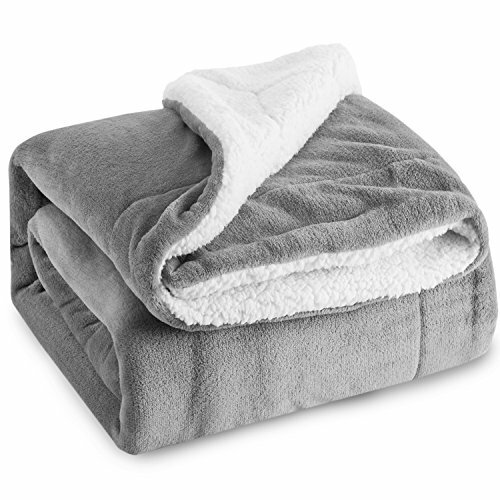 UNIQUE DESIGN PHILOSOPHY: BEDSURE Dual Sided Super Soft Blanket with Fleece Face and Plush Sherpa reverse offers you different senses of softness to improve your sleep with one side of smooth and fluffy to the other - Bring you ultimate soft and warmth with 220 GSM Fleece top and 280 GSM Sherpa reverse blanket - Bound together with decorative knit-trim edging for a superior appearance. FABULOUS BLANKET BENEFITS: Throw Sherpa Throw Blanket for couch measures by 50" x 60" is perfect for homeowners with sophisticated tastes in decoration home - The fabulous color enhances this blanket throw with an elegant and superior appearance to complement your room a chic feeling - Shield a layer to protect your luxury bed and couch from dirt and stain to keep them fresh and clean.